Each year as we start the new year, we think of ways to make a change and improve our lives. Did you know that organizing is one of the top three goals each year? Throughout the month of January, I will be offering 31 tips to help you have Your Most Organized Year Ever. Implement just one of these tips, tools, techniques or tweaks this year. Accountability is being willing and obligated to a task. It’ not always easy to feel or be accountable to others. It takes a trusting relationship and a perspective of learning from missteps. 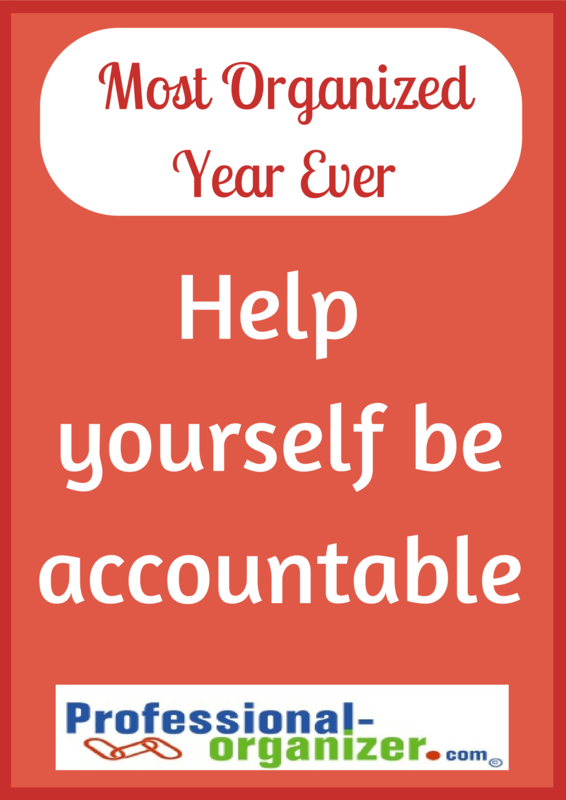 There are many ways to accomplish a goal using accountability. Working together as a team can help you get a task accomplished. When you are accountable for your step of the project, you know you will follow through. You have team ownership. Just speaking out loud about a project, describing it and discussing it, can help you process your thoughts on a project. You are more prepared to complete it because you have clarified your work. It may be just to speak about a project out loud and it’s enough for you. Check out all 31 Tips for Your Most Organized Year Ever.